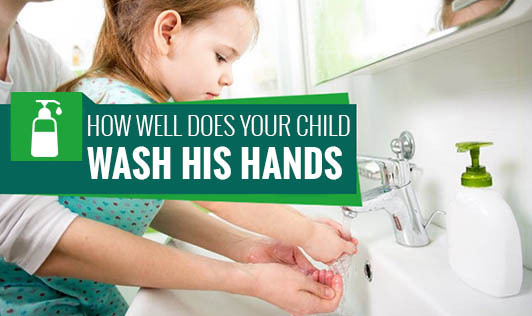 How Well does Your Child Wash His Hands? Hand washing is one of the most effective ways to prevent infections and illnesses in children. As our traditional culture goes, one needs to wash hands and legs before entering the kitchen. It probably has a reason. The habit of cleanliness and hygiene starts at home and extends to your child's school, play ground etc. Washing hands is easy and has a technique to it to make sure that your hands are completely clean... Parents should follow this technique and set the right example to their children. Here are some steps to wash hands in a hygienic manner to make sure your hands are completely clean. Apply enough soap or a hand wash solution to cover all hand surfaces. Dry with towel or a tissue. You can even use an electronic drier. Other than these steps, keep the container in which the liquid hand soap is filled as clean as possible. Wash the hand towel every two days. Clean the tissue holder and the electronic drier once in a while. Teach your child when to wash hands like after coming back from school or the playground, after using the toilet, after touching his pet, or even before he uses his hands to eat anything. Teaching your child to wash his hands after blowing his nose, coughing or sneezing is very important as it can avoid the spread of infections. Washing hands may appear as a very insignificant chore in a day, but however, it is the most important that every child must follow to stay healthy!